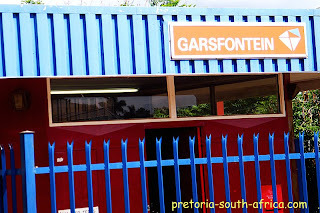 Garsfontein Post Office is situated around the corner from the Garsfontein Police Station. 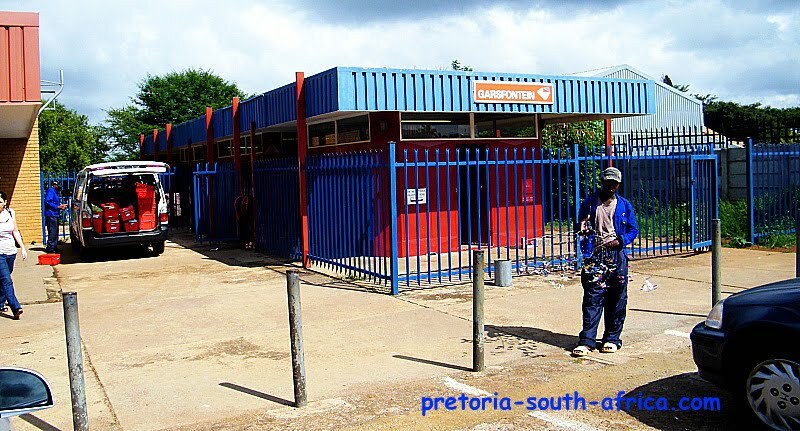 I always liked this post office until South African security obsession crept in. Dont get me wrong, I love security and any measure that makes me feel safe is always welcome. In the case of Gars post office’s erected palisade fencing though, I feel more unsafe than before. The first time I spotted the fencing, I thought, “Wow! They matched the blue so well”. Instead of that beautiful sigh of relief followed by "they thought of everything". No they didn't. Got out of my car and looked for entrance. I saw a tiny gate open. Apparently there are two gates but when I get there on Saturdays or Sundays, I see one gate open. This gate is actually tiny with a capital "T". As I step inside the box, I immediately feel intensely unsafe. Bear in mind, the post box area has hidden corners and you are enclosed in this area with only one tiny escape gate. What were they thinking? Do we need to have our post boxes secured? 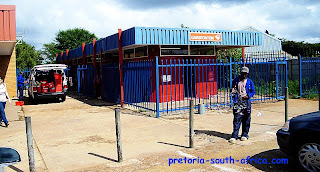 The main building with the counters is not enclosed but our post boxes and re-posting booths are secured. I don’t get the point to this security measure. This happens to be the most popular spot for art vendors. I hope someone will respond with a comment that makes me understand the logic behind all these bars. 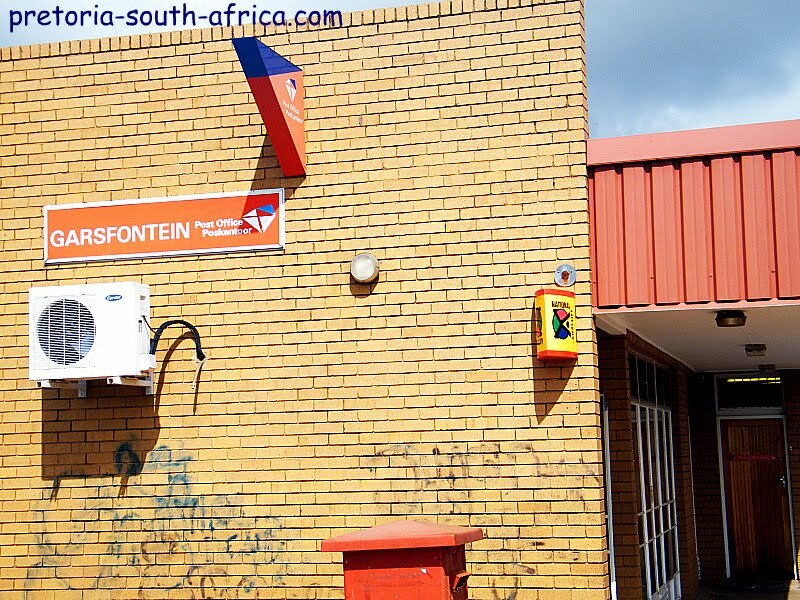 “Four armed men fled with an undisclosed amount of money after robbing a Garsfontein Post Office on Wednesday, Gauteng police said. Spokeswoman Eveline Hardaker said the four arrived at the post office at 2pm and waited in the queue, posing as customers. "When they got to the counter, one ordered everybody to sleep flat on the floor. The [other] three jumped over the counter, robbed cashiers of all their money and the money that was in the safe." No prize for guessing the reason I feel even safer at the moment. Hey, what's going on? I have not heard from you in a long time. Everything OK? The parcel service provided by the staff at this Post Office is appalling. Collection slips for parcels to be collected by the owner are often put in the wrong postbox and whoever gets the slip can then collect the parcel WITHOUT BEING ASKED to SHOW a ID DOCUMENT!! When I spoke to the manager of the post office she said they did not request any id from people collecting parcels because "The people collecting the parcels was shouting at them when they did not hand it over without proof of id." This is done even though it is clearly stated on the collection slip that positive id must be shown before a parcel can be collected. I have been a victim of this when an expensive item which was send to me was collected by somebody else from their post box and was handed over to this person without being asked for his / her id document. The item is now in somebody else 's possession. The sender has proof of delivery and I am out of pocket for R700. 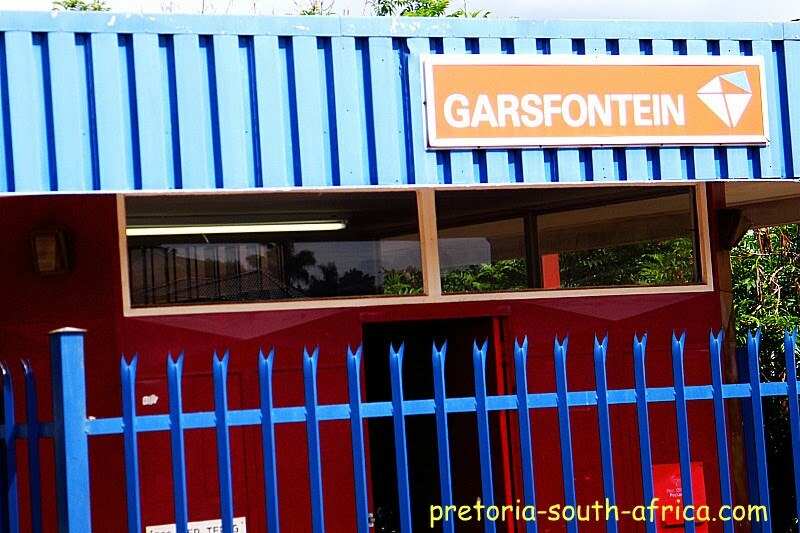 ID documents are still not requested at Garsfontein Post Office before parcels are handed over by staff. 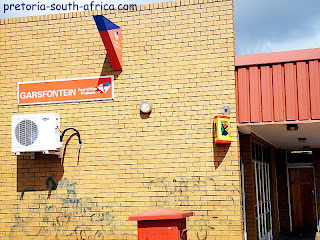 My advice is that you should be very careful if you are thinking of having parcels send to Garsfontein Post Office. Using the services of a courier is recommended rather than to suffer losses which are because there is NO MANAGEMENT and staff is INDIFFERENT to YOUR LOSS! There is certainly practically a full week March Madness of action before the NCAA tournament announces it is field on Selection Saturday. But even though that won't happen until Mar 12, March Madness Live it's simple enough to project the four Little. 1 seeds in Mar Madness. The four top seeds should be March Madness Live Stream shielding national champion Villanova, North Carolina, Kansas and Gonzaga. Those four have recently been at the top of the rankings and also have also been the selections of bracketologists March Madness Bracket like ESPN's Later on Lunardi and March Madness 2017 s Jerry Palm, and it could be a surprise if they didn't emerge at the conclusion of the meeting tournaments that will be held at throughout the week. Villanova is the Zero. 1 seed in the Big East tournament 2017 March Madness , and while that league has regularly produced upsets in the conference tournament, it would be somewhat of a shocker if the Wildcats didn't make it to it game. If perhaps they face second-seeded Retainer, it could be a good game that will go down to the line because Butler has defeated Villanova twice. When it is any other Big East team, the Wildcats would be a significant favorite. Let's just enjoy the diversity, instead of promoting false ideas that attempt to discredit the powerhouses that can lure five-star talent to their campuses. Mcgregor vs Mayweather For quite a long time, the UFC lightweight champion has been entangled in transactions with resigned boxing ruler Floyd Mayweather as the two sides endeavored to consent to an arrangement that would without a doubt set up together one of the greatest battles in battle sports history. There has been a huge amount of doubt from everyone required on regardless of whether the two sides could at last go to a concurrence on a money related split for the benefits on the battle. here were three or four moments when it felt like the season might slip away from Milwaukee. Hell, Monroe could have checked out after Kidd banished him from the rotation midseason. He stayed engaged. The team righted itself every time. Sweep weekend home games against Atlanta and Chicago, and the Bucks could enter next week as an unlikely fifth seed. Great work, fellas. Watching the Nets during the Brooklyn era has not been invigorating. The good teams were boring, and the bad teams have been hopelessly bad. Can you imagine the torture of broadcasting every single game, and trying to be serious about it? Really thanks for your blog it give everything what i nedd. Hi Mayweather vs McGregor Live, https://mayweathervsmcgregors.co/ PPV, Fight To Fight, 26-August-2017, HD, Fight at Las Vegas, Nevada, Floyd Mayweather Jr vs Conor McGregor All Info.